Knitting for hire, one heirloom at a time. BESPOKE: adj. 1. custom-made, 2. dealing in or producing custom-made articles. I'm an award winning* knitter based in Minneapolis, MN, and am available upon request for custom knits, repairs, alterations, finishing, test or sample knitting, and one-on-one knitting lessons. 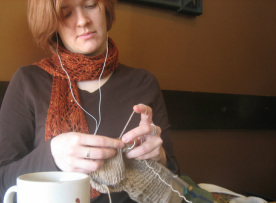 Whether you are a knit lover, an aspiring knitter, or an experienced knitter; I can help you. Take a look around, get inspired, and let's design something together! * My Bohus won a blue ribbon in its category (colorwork, limited use, pullover) at the Minnesota State Fair in 2014. I modified the design with color choices and added colorwork on the cuffs and hem. It's knit on size 3 needles with seven different colors of organic, undeyed alpaca from the Fields of Grace Alpaca Farm in Ohio, and took about 150 hours to knit. Logo design by Jillian Perkins.